Prosecutors are dropping all charges against Empire actor Jussie Smollett in a surprising and controversial move that has exposed a stark fault line between Chicago's local authorities and their county and state counterparts. 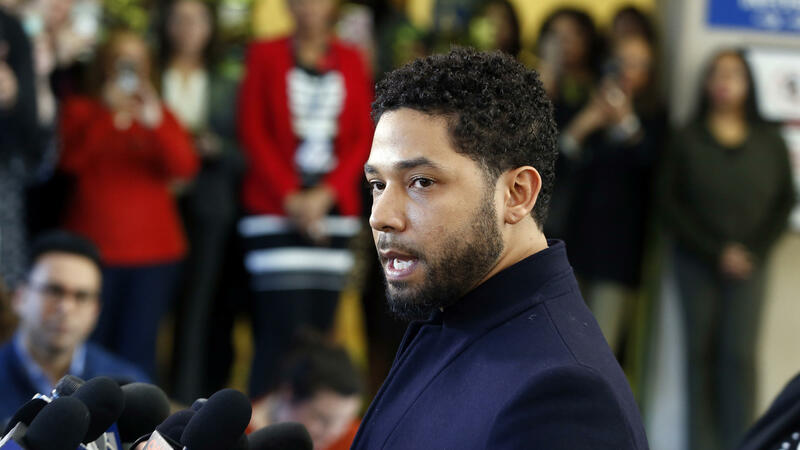 The decision Tuesday appears to clear Smollett of allegations that he filed a false police report earlier this year when the actor, who is gay and black, claimed that he was attacked in Chicago in a possible hate crime. Prosecutors in Cook County, Ill., said they would not pursue the grand jury indictment against Smollett, which returned 16 felony counts of disorderly conduct against him. Tuesday's decision, according to the Cook County State's Attorney's Office, had to do, in part, with the actor's community service and bond payment to the city. "After reviewing all of the facts and circumstances of the case, including Mr. Smollet[t]'s volunteer service in the community and agreement to forfeit his [$10,000] bond to the City of Chicago, we believe this outcome is a just disposition and appropriate resolution to this case," the office led by State's Attorney Kim Foxx said in a statement emailed to NPR. Foxx recused herself from the Smollett investigation last month to "address potential questions of impartiality based upon familiarity with potential witnesses in the case," according to a statement released at the time. First Assistant State's Attorney Joseph Magats, who took over on her behalf, said the decision should not necessarily be viewed as an exoneration. "The fact there was an alternative disposition in this case is not and should not be viewed as some kind of admission there was something wrong with the case or something wrong with the investigation that the Chicago police did," Magats told the Chicago Sun-Times, explaining: "It's a nonviolent crime. He has no felony criminal background." "I've been a cop now for about 31 years, and when I came on this job, I came on with my honor, my integrity and my reputation," Johnson said Tuesday. "If someone accused me of doing anything that would circumvent that, then I would want my day in court, period — to clear my name. Chicago police spokesman Anthony Guglielmi summed up the department's position more succinctly: "In our experience," he tweeted, "innocent individuals don't forget bond & perform community service in exchange for dropped charges." Not long after his arrest in February, the actor was removed from the final episodes of Empire's season — "to avoid further disruption on set," the show's producers said at the time. 20th Century Fox Television, the company behind the show, issued a brief statement after Tuesday's announcement. "Jussie Smollett has always maintained his innocence and we are gratified that all charges against him have been dismissed," the company said in its statement to NPR. Smollett himself reasserted his innocence at a news conference after his hearing. "This has been an incredibly difficult time — honestly, one of the worst of my entire life. But I'm a man of faith and I'm a man that has knowledge of my history, and I would not bring my family, our lives or the movement through a fire like this."